This newly decorated apartment is on the ground floor of a two storey block with entrance door off the private terrace. Inside it is clean, modern and filled with light from the double glass doors to the private terrace and garden area. The furniture is stylish and the apartment has all the necessary equipment and amenities for a relaxed self catering holiday plus air conditioning units in the main rooms. The RioMar 13 gated development has 6 blocks of apartments, each has 2 storeys and in total there are approximately 90 apartments in the development surrounding a large shared swimming pool with Jacuzzi and shallow area for children. There is a small children’s play/park area and an indoor games room/community room. This is a quiet development with most apartments owner occupied and around a quarter let for holiday rentals. En-suite bathroom to bedroom 1 has bath, separate shower, wc, bidet with fitted under sink storage cupboard. The main bathroom is off the hall with a shower, wc, bidet and fitted storage under the sink. Underground parking and store room for golf clubs, Bikes, Beach Chairs etc. The lounge/diner has a 3 seater and 2 seater leather sofas, coffee table and tv unit with flat screen tv and dvd player. There is a dining table with 4 chairs next to double glass doors opening onto the terrace which also has an outdoor table and chairs. Situated within a 10 minute drive of the apartment are the courses of Lo Romero, Las Colinas, Campoamor, Villa Martin and Las Ramblas within a 30 minute drive are the courses of La Marquesa, La Finca and Vistabella. Las Colinas currently hosts the qualifying tournament for European PGA stage 2. The regions of Alicante and Murcia have over 40 different golf courses accessible by excellent road links, many courses have been designed by former greats such as Seve Ballesteros, Jose Maria Olazabal and Jack Nicklaus. Notes on accommodation: The TV is connected to satellite providing English freeview channels. Outside: The apartment has an outdoor terrace off the lounge, the terrace is tiled with a step down to a private garden area with astro turf surrounded by hedging for privacy. There is an outdoor table and chairs. The development has landscaped gardens with large lush areas of grass around the pool with plenty of space for sun loungers. The shared pool is not heated but large (approx 25m) and has a Jacuzzi area and shallow kids pool. In the grounds there is a children's park with play equipment, a communal games room and the development is very secure being gated with 3 locked access gates, a key is provided for guests. Utility Room: The apartment has a locked storage cupboard with 2 sets of golf clubs and 2 bicycles, the key can be provided for guest use if required. Cleaning / Towels / Linen / Maid service: Towels and bed linen are provided, changed weekly when the apartment is cleaned. Other: The apartment has one parking space in the underground car park, access key to car park can be provided on request if you have a hire car. The windows and glass doors are shuttered and the windows have decorated grilles for security but can be opened. 10 minutes walk to beach, this part of the coast has around 5 kilometres of sandy beaches and if you walk a little further down the pedestrian strip built along the beach there is an area of the beach with loungers and parasols for hire. The apartment is 15 mins drive from San Javier (Murcia) airport and 40 minutes from Alicante, we can provide a driver to collect you from either airport for a fixed charge who can even take you via the supermarket for supplies if requested. Car hire is not essential but if you wish to explore further afield or are staying for golf a car is recommended and a private parking space is available in the underground car park of the development. Cabo Roig, La Zenia and Pilar de la Horadada are the closest towns being a 5-10 minute drive away. 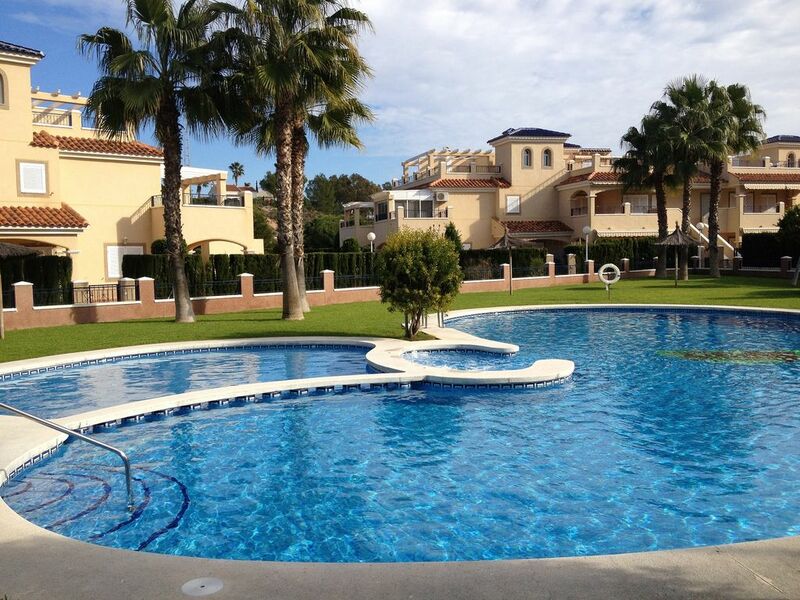 Torrevieja is approximately a 25 minute drive away. Booking Notes: Please contact owner.A cleaning fee of 50 Euros is payable locally on departure. Changeover Day: Please contact owner. Notes on prices: Discounts are available for long term rentals in low season.